The Splitz-assist is a combination of a chain, bungee, custom hook and handle. 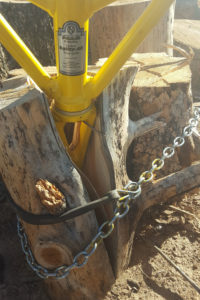 The chain holds the log in place while the bungee expanse to allow for separation of the wood while splitting. With the Splitz-Assist you can take small logs that easily fall over and bundle 3 or more. 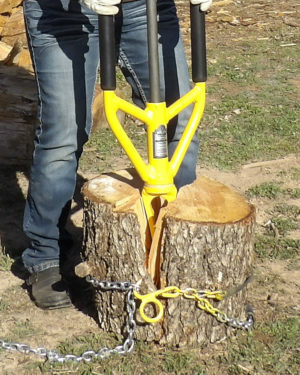 This creates stability for each log to stay in an upright position while you split the wood. 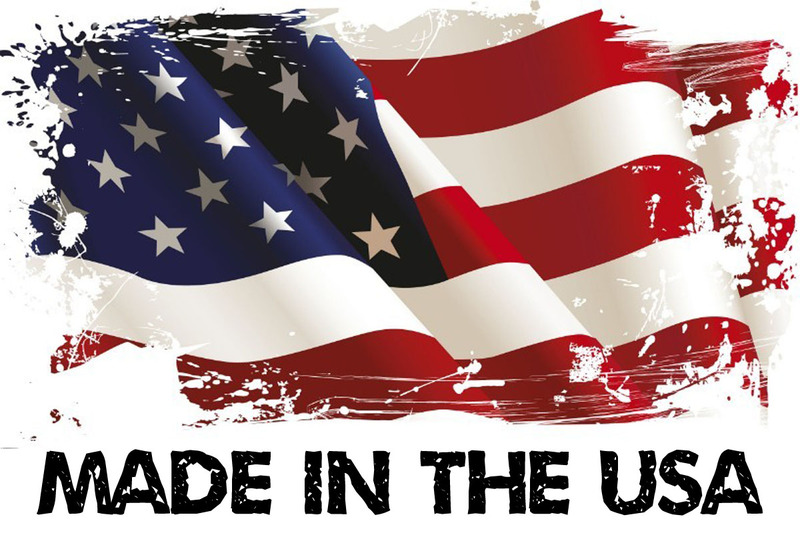 So what are the benefits of the Splitz-Assist to split wood. 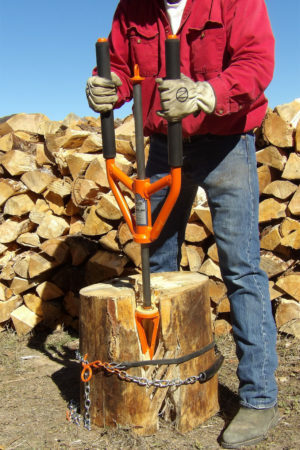 Once you put the Splitz-Assist on the log it holds all the split wood pieces together. You don’t need to bend over again until the log is fully split. This reduces the amount of bending and lifting. You can split any size firewood clear down to kindling, without bending or touching the log. A cleaner and smaller working area is created with little to nothing to stumble over. Split firewood pieces won’t fall back and hit your legs while splitting the wood. Then when the log is fully split, it is easy to pick up the full split log and carry it to the wood pile. 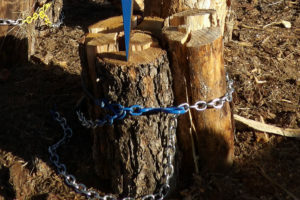 Then undo the hook, pull the chain off, and your logs are easily stacked, making it easy to stack wood. Now isn’t that a more effective way to utilize your time and energy? It is difficult to balance the tip of the Splitz-All on a possibly unstable log. The log then tips over and one must bend over to reset the log position. Repetitive bending may cause pain and damage to your back, takes more time to reset, and uses more energy. Pieces may fall over and hit your leg. Fallen firewood pieces can become an obstacle for walking around the log. If a firewood piece is too big, then you have to bend over, reposition the unstable piece of wood, (hope it doesn’t fall over) and then split the log again to the right size. When your done splitting you now have multiple pieces of firewood to bend and pick up, strain your back and possibly scrap up your arms.